I poured some Beaujolais nouveau into a Guertena gallery glass. It's awfully difficult to take a sufficiently pretty photo of wine, huh. I couldn't do it very well. 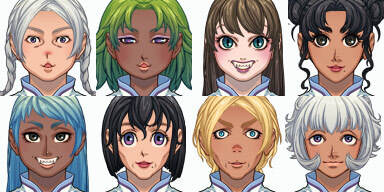 That's right, I bought the new RPG Maker, so I quickly went to play with the face sprite creator tools. Quite a few more parts were added in the full version. I made a revenge attempt on the Ib characters. I feel they're better than the previous ones. Maybe I could make them look a bit better, but this is my personal limit. I think both Marys are actually pretty good, don't you? Of course, the most amusing function is the random creator. This is how it ends up. The top-right two are okay, but the others have this lack of balance that makes me laugh. 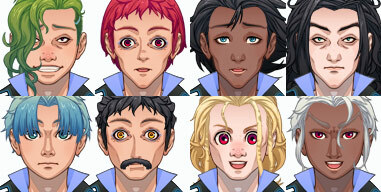 The second from the top-right has the same hair I used for Ib, yet fills me with immense terror. I tried randomizing about 50 times, but very rarely could I get a cute one. but this is really all you get! If anyone wants to make a cool or cute character, it's best that you choose the parts yourself. But I thought how this could be handy for making random NPCs. 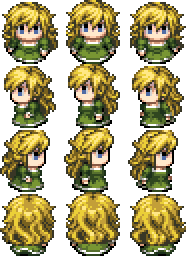 Since it thankfully makes walk sprites as well, its power could likely be demonstrated in cases when a lot of people are needed, like soldiers in a castle or merchants. Oh, and you can also add things like elf ears, tattoos, and accessories.